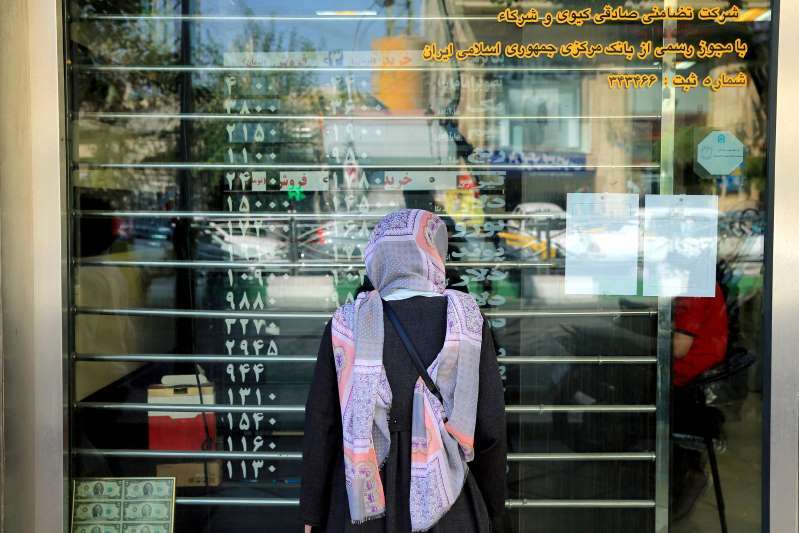 © Ebrahim Noroozi/Associated Press A woman looks at currency exchange rates in Tehran. The Trump administration is counting on Saudi Arabia to help implement tough sanctions on Iran next month. White House officials are worried that the apparent killing of the dissident journalist Jamal Khashoggi, and Saudi Arabia’s changing account of his fate, could derail a major showdown with Iran and jeopardize plans to enlist Saudi help to avoid disrupting the oil market. Officials said the dilemma comes at a terrible moment for the Trump administration, which will reimpose harsh sanctions against Tehran on Nov. 4, with the intent of cutting off all Iranian oil exports. But to make the strategy work, the administration is counting on its relationship with the Saudis to keep oil flowing, and to work together on a new policy to contain Iran in the Gulf. If it moves forward, the Saudis would probably see a significant increase in oil revenues at exactly the moment Congress is talking about sanctioning the kingdom. It is one reason that Secretary of State Mike Pompeo was sent, with a few hours’ notice, to see King Salman of Saudi Arabia and Crown Prince Mohammed bin Salman. Part of the problem is optics, officials said: The Saudis look like a pretty brutal ally, just as President Trump and Mr. Pompeo have been casting Iran as the regional disrupter. In interviews, administration officials and the outside experts whom they are consulting said that possible repercussions on an elaborate plan to squeeze the Iranians have dominated internal discussions about the fallout over what happened to Mr. Khashoggi. The officials spoke on condition of anonymity because they were not authorized to publicly discuss internal discussions. By comparison, they said, the issue of limiting American arms sales to Saudi Arabia, which Mr. Trump has said would threaten American jobs, pales in importance. On Nov. 4, the administration is expected to announce that any company that does business with Iran — buying oil, financing projects or investing in the country — will be prohibited from doing business in the United States, including clearing transactions in dollars. The strategy would present a common front with the Saudis, and cast Iran as the source of almost all instability in the Middle East. That argument, officials have now acknowledged, is now in jeopardy. Mr. Pompeo’s message, officials said, was that a credible investigation and a Saudi explanation of what happened had to be conducted rapidly, before it imperiled the rest of the agenda that Mr. Trump and his lieutenants have devised with the kingdom. Mr. Pompeo’s spokeswoman, Heather Nauert, appeared to be referring to that issue, at least obliquely, when she issued a statement describing the meetings in Riyadh on Tuesday. “While the United States has a number of regional and bilateral issues to discuss with Saudi leadership, learning what happened to Jamal Khashoggi is the primary purpose of this trip,’’ Ms. Nauert said. Mr. Khashoggi, a columnist for The Washington Post, has not been seen in the two weeks since he entered the Saudi Consulate in Istanbul. A number of Saudi officials, including Prince Mohammed last week and the king on Monday, have denied any involvement in his death, despite assertions from Turkish officials that Mr. Khashoggi was murdered and his body dismembered. Middle East experts said the goal for Mr. Trump and the Saudis was clear: Get the Saudi role in Mr. Khashoggi’s disappearance out of the headlines and focus anew on the Iranians. “I think they have a very strong incentive to cook up some story that will get us out of this fix,” said Gary Samore, the director of the Crown Center for Middle East Studies at Brandeis University, and a former top White House aide on nuclear issues for President Barack Obama. But the key issue motivating the administration, he noted, is the close coordination needed with the Saudis as the crackdown on Iran unfolds. “They can’t really do it without the Saudis keeping up high production,” Mr. Samore said, referring to oil. Even then, he said, the administration may need to give temporary “exemptions” to some countries that claim they need to continue oil imports from Iran. The result is that just as Congress talks about economic or military sanctions against the Saudi government, the country’s oil revenues may actually rise, as they pick up business previously filled by Iran. To sanction what the Saudis care about most — oil revenues — would be to undercut the Iran policy and send the price of gasoline and heating oil significantly higher, just as winter approaches. The White House’s focus on Iran is evident from a forthcoming article in “Foreign Affairs” that Mr. Pompeo wrote before Mr. Khashoggi’s disappearance. It is titled “Confronting Iran,” and depicts Iran — along with North Korea — as the two major threats Mr. Trump is committed to defanging. The article makes only one reference to Saudi Arabia — as a country that is the target of Iranian-made missiles.